The policy shift is outlined in the Pentagon's Nuclear Posture Review (NPR) that calls for modernizing aging weapons and delivery systems but not building new, more efficient and safer warheads. Instead, the older warheads and bombs will be maintained and some made smaller. "We must keep America's deterrent credible by making it modern," Deputy Defense Secretary Patrick Shanahan told reporters in unveiling the NPR. Shanahan said the decision to lower the yield of some warheads on a few of the Navy's 14 missile submarines and bring back retired sea-based nuclear cruise missiles will not increase the risk of war. Responding to anti-nuclear critics opposed to deploying the smaller nuclear weapons over concerns about increased risk of conflict, Shanahan said, "On the contrary, it is the exact opposite." The United States would only consider using nuclear weapons in extreme circumstances, he said. The review warns that nuclear dangers are increasing as China and Russia modernize and expand their forces and North Korea is also gaining new nuclear capabilities. Iran, despite the Obama administration's nuclear accord, could build a nuclear weapon within one year of a decision to do so. "The United States now faces a more diverse and advanced nuclear-threat environment than ever before, with considerable dynamism in potential adversaries’ development and deployment programs for nuclear weapons and delivery systems," the report said. While the United States reduced the numbers and reliance on nuclear forces, Russia, China and others "moved in the opposite direction," the report said. "They have added new types of nuclear capabilities to their arsenals, increased the salience of nuclear forces in their strategies and plans, and engaged in increasingly aggressive behavior, including in outer space and cyber space," the report said. The report says the United States favors arms control with Russia and China. However, Russia has broken off all arms talks and China continues to refuse to engage in nuclear talks as part of its long-standing policy of not disclosing details of its nuclear forces. The report declares that the United States, through the Pentagon and Energy Department, will sustain, replace, and modernize the warheads, bombers, and missiles that make up the force, along with the command and control system that directs it. 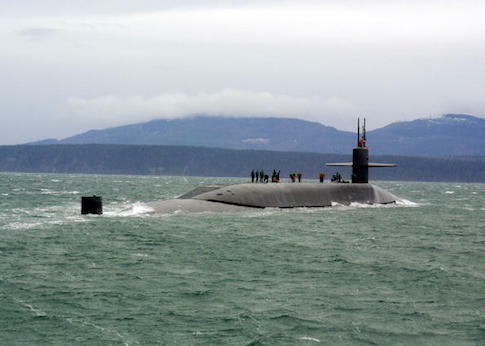 Current forces consist of 14 aging Ohio-class missile submarines that will be replaced by 12 Columbia-class submarines in the coming decades. The 400 single-warhead Minuteman III missiles deployed in silos will also be replaced with a new missile through 2029. The 46 nuclear-armed B-52 and 20 B-2 bombers also will be replaced by the B-21 beginning in the mid-2020s. A new air-launched Long-Range Stand-Off nuclear cruise missile will replace aging air-launched cruise missiles. Currently, the small nuclear force consists of a small number of B-61 gravity bombs carried by aircraft. Facilities and technicians that are part of the nuclear weapons infrastructure also will be bolstered. The section of the review on the use of so-called non-strategic weapons said the change is needed because of the "dramatic deterioration of the strategic environment." A chart included in the report showed that Russia enjoys a huge advantage over the United States in tactical nuclear weapons. Moscow's up to 2,000 small nuclear weapons are deployed on close-range and short-range ballistic missiles, anti-missile interceptors, anti-aircraft missiles, ground-launched cruise missiles, air-to-surface missiles, anti-ship missiles, depth charges, anti-submarines missiles, torpedoes, and gravity bombs. The U.S. arsenal of tactical nuclear weapons is limited to gravity bombs. Russia has altered its doctrine to allow for the more rapid use of nuclear forces in a conflict and has shown off its advantage in these weapons in military exercises and statements. North Korea also is developing small nuclear weapons in addition to larger devices. Without matching the Russian small nuclear arsenal the United States will seek to preserve deterrence stability through "a spectrum of capabilities sized and postured to meet U.S. needs." The goal is "to ensure that no adversary under any circumstances can perceive an advantage through limited nuclear escalation or other strategic attack," the report says. "Expanding flexible U.S. nuclear options now, to include low-yield options, is important for the preservation of credible deterrence against regional aggression," the report said. In addition to small warhead submarine-launched ballistic missiles and submarine and surface ship-launched nuclear cruise missiles, the military may expand deployment of nuclear capable aircraft around the world, including on the new F-35. For the submarine ballistic missiles, a small number of existing submarine missile warheads will be made smaller. "Low-yield nuclear weapons have been in the U.S. arsenal for decades," said John Rood, undersecretary of defense for policy, in a briefing for reporters. Rood said the shift to smaller nuclear weapons is designed to counter the actions of adversaries. "When we look at some of the activities, statements, capabilities that adversaries or potential adversaries have pursued, one of the things that we want to make sure that we maintain is a flexible set of capabilities, so that they not come to the mistaken impression that there would be some ranges of situations where they might employ nuclear weapons—whether they be low-yield or so-called battlefield nuclear weapons, things of that nature—in a way that we would feel that we did not have credible response options in order to preserve deterrence," he said. North Korea's development of nuclear weapons and missiles has also prompted greater concern about modernizing the U.S. arsenal that includes most weapons built in the 1980s or earlier, Rood said. President George H.W. Bush in 1991 ordered dismantling of the main nuclear cruise missile, the Tomahawk Land Attack Missile-Nuclear, or TLAM-N. The removal of the nuclear cruise missiles continued under President Bill Clinton in the 1990s. Many of the warheads for the TLAM-N force have been dismantled. The posture review states that a new sea-launched nuclear cruise missile will be pursued. The new missile "will provide a needed non-strategic regional presence, an assured response capability, and an INF-Treaty compliant response to Russia’s continuing Treaty violation," the report says. The report said the restoration of the capability would begin immediately. By contrast to the limited U.S. modernization, Russia is building new nuclear weapons in addition to modernizing older ones. "Russia is also developing at least two new intercontinental range systems, a hypersonic glide vehicle, and a new intercontinental, nuclear-armed, nuclear-powered, undersea autonomous torpedo," the report said. China is building a new road-mobile strategic intercontinental ballistic missile, a new multi-warhead version of its DF-5 silo-based ICBM, and its most advanced ballistic missile submarine armed with new submarine-launched ballistic missiles. A new strategic bomber is in the works that will provide China with a nuclear triad of missiles, submarines, and bombers. The U.S. nuclear policy is called "tailored deterrence" that seeks a mixture of forces and weapons, and developing flexibility by mixing nuclear and other forces. "This review rests on a bedrock truth: nuclear weapons have and will continue to play a critical role in deterring nuclear attack and in preventing large-scale conventional warfare between nuclear-armed states for the foreseeable future," Defense Secretary Jim Mattis said in a preface to the review, adding "we will be relentless in ensuring our nuclear capabilities are effective." Both China and Russia have responded to a leaked draft of the nuclear posture review by warning that the United States' pursuit of smaller yield nuclear weapons will increase the risk of a nuclear war. Russia, however, is rapidly developing small and very small nuclear weapons to support its new doctrine of using the arms to "de-escalate" conflicts. China also is believed to have large numbers of small nuclear warheads for its large force of missiles, both ballistic and cruise missiles. This entry was posted in National Security and tagged China, Nuclear Weapons, Russia. Bookmark the permalink.